The fees for students of the University of Cape (UCC) for the 2017/2018 academic year have been released as the reopening dates for freshers and continuing students have been rescheduled. In a press release issued by the Students’ Representative Council (SRC) [today] Monday, 7th August 2017, students are to pay the fees charged last academic year and payment of fees could be made starting tomorrow, Tuesday, 8th August, 2017. “Students are to pay fees charged last academic year and payment starts tomorrow”, it stated. Reopening dates have however been rescheduled to Friday, 18th August, 2017 and Wednesday, 23rd August, 2017 for freshers and continuing students respectively. Students are to note that the actual fees will be communicated later when the necessary approvals have been obtained from Parliament. 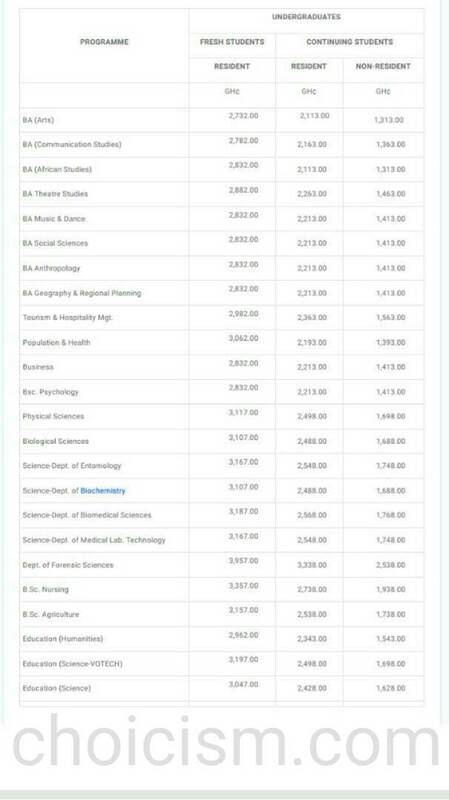 Below is last academic year’s fees which has been maintained for this year.